Ground fighting is an important part of the sport. 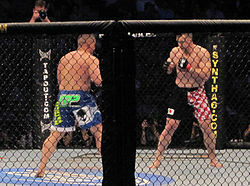 Mixed martial arts (or MMA) is a hybrid martial arts form. It includes any mixture of combat disciplines or any blend of two or more styles of martial arts. MMA can also mean the sport of mixed martial arts fighting. Bellator, WSOF, ONE Championship, and UFC are companies that promote MMA sport fighting. The people who organize a MMA fight can decide the rules for that fight. There is no one group of people who decides the rules for all MMA fights,in the world. Some states regulate all professional fights including MMA fights and set some rules. MMA fights once had few rules, but now have many rules to protect the fighters. Boxing (and other fighting sports) also have many rules, different from those in MMA. Fighters can use any martial art, or combination of arts, they like in the fight. In these fights, fighters can fight standing with punches, kicks and other strikes, in a clinch where fighters are grabbing each other while standing, or on the ground. An example of an illegal strike is the 12-6 elbow strike. It is illegal under the Unified Rules of Mixed Martial Arts, where it is called "striking downwards using the point of the elbow". The ban was made for medical and safety reasons, due to it being likely there would be serious injuries to opponents if they are used. Each fighter will try to defeat the other either by submission, or knock out. Each fight can last only for a period of time, after the time ends, judges decide who is the winner. The referee in the fight will make sure no one gets hurt too badly and that rules are followed. The pankration was an old style of unarmed combat. The ancient Greeks introduced this sport into the Olympic Games in the 648 BC. Some public fights took place at the end of the 19th century. They represented different styles of fighting, including jujutsu, wrestling, Greco-Roman wrestling and others in competitions and challenges across Europe. After World War I, wrestling was born again in two main flows. The first flow was real competition; the second flow began to depend more on the choreography and on the grand public shows that resulted in professional wrestling. Modern mixed martial arts (MMA) has its roots in two kinds of competition: the Vale Tudo (Brazil) and Japanese Shootfighting. Vale Tudo began circa 1930, when Carlson Gracie invited every competitor to compete in a fight. That was the so-called "Gracie's Challenge". Later, Hélio Gracie and the Gracie family continued this. Vale Tudo translates to "Anything Goes", as it had almost no rules. In Japan, about 1970, Antonio Inoki organized a series of mixed martial arts fights. They were the forces that produced the Shootwrestling, and they later caused the developing of the first organization of mixed martial arts, known as Shooto. Mixed martial arts obtained great popularity in the United States in 1993, when Rorion Gracie helped create the first UFC event, one of the earliest MMA events in the USA . In 1997, in Japan, the interest for this sport resulted in the creation of the greater organization of mixed martial arts - Pride Fighting Championship. The Gracie family caused the tournaments, as the UFC, to be well known. It should be noticed that the UFC is the most famous tournament, but the persons who practises Brazilian jiujitsu normally do not use blows. Undoubtedly, the Gracie family played an important role in the creation of open competitions of Vale Tudo and in causing them to be well known through the television. Nevertheless, before anyone created the UFC or Shooto, where the persons who represent every method of self-defense can fight, there had already existed such mixed martial arts. About the year 1990, three styles were famous for their effectiveness in the competitions of the mixed martial arts: the wrestling, the Brazilian jiu-jitsu, and the shootwrestling. This can be because of their attention given to the combat by means of holds. Before the year 1990, the promoters organized a lacking amount of the competitions of the mixed martial arts, and some martial arts base on blows. Therefore, probably, most instructors of these arts had given too little attention to the holds. ↑ "Mixed Martial arts Unified Rules of Conduct". New Jersey State Athletic Control Board. September 5, 2002. Retrieved 2006-06-18. ↑ Marrocco, Steven (2014-01-13). "The strange story of MMA's most misunderstood illegal elbow strike". MMAjunkie. Retrieved 2015-05-10. This page was last changed on 13 October 2018, at 23:49.